This Valentine’s Day, instead of going out to dinner, show your sweetheart how much you love them by cooking a romantic meal at home. When you cook at home instead of going out, you don’t have to worry about making reservations, you avoid the crowds, and you save money. And the best part is that you can create a menu that you and your loved ones will enjoy. If you’re looking for inspiration, try my Filet Mignon with Pomegranate Dijon Sauce as an entrée along with my Roasted Asparagus and Grape Tomatoes with Balsamic and Pecorino. And to end the dinner on a sweet note, dive into my Chocolate Espresso Pots de Crème. Filet mignon (aka beef tenderloin) is the most tender cut of beef and also the most expensive. Although it’s pricey, it will cost you a lot less to prepare it at home than to order it at a restaurant. And although you generally want to limit the amount of red meat that you eat, there are actually 29 cuts of beef that are considered to be “lean.” To meet the USDA standards as a lean cut of beef, a 3.5 ounce serving must have less than 10 grams total fat, less than 4.5 grams saturated fat, and less than 95 milligrams of cholesterol (for more information check the link at the bottom of the post). Beef tenderloin is included on the list of lean cuts. I like to serve the steak with a simple pan sauce made with pomegranate juice, Dijon mustard and beef stock. The sauce has a delicious sweet and savory flavor as well as a lovely rich, ruby color that’s perfect for Valentine’s Day. My Roasted Asparagus and Grape Tomatoes with Balsamic and Pecorino is a simple and delicious low calorie dish that also provides a good amount of fiber, protein and several vitamins and minerals. I sprinkle some Pecorino Romano cheese on top before serving- only a small amount is needed to add a nice salty bite. And I top it all off with a drizzle of Mandarano Balsamic Glaze & Sauce which is syrupy, sweet and delicious. The generous folks at Mandarano sent me a bottle of their product for being one of the winners of their Instagram photo contest. It’s the perfect accompaniment to this dish and is a simple way to add lots of flavor. You can substitute a good quality balsamic vinegar or make a balsamic reduction by simmering regular balsamic vinegar in a pot on the stove for several minutes to thicken it. It is a custard dessert made with cream, eggs and flavorings (commonly chocolate) that’s baked in the oven in a water bath. The point of the water bath is to provide slow, even cooking for delicate desserts like custards and cheesecakes. It is typically served in a small lidded pot (hence the name) and chilled before serving. 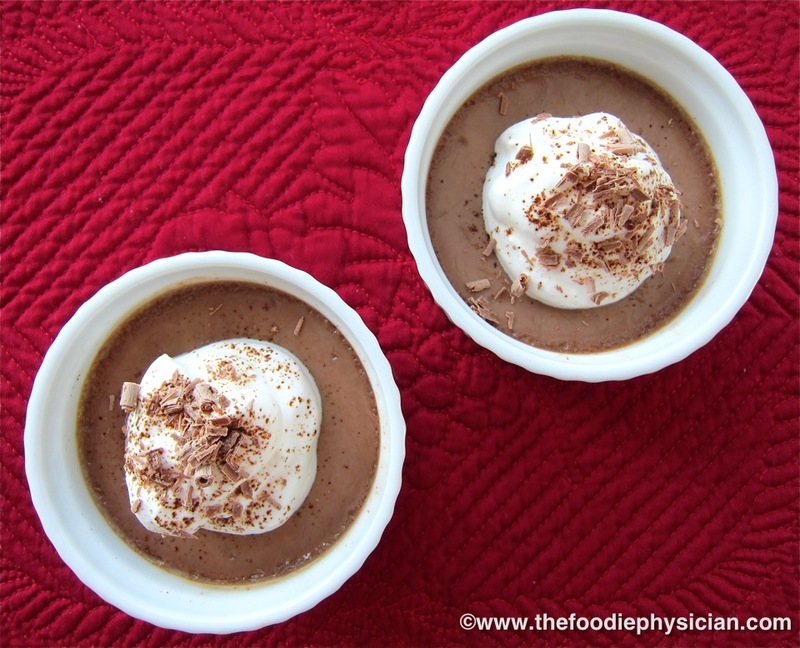 It’s like a more sophisticated version of chocolate pudding, my husband’s favorite dessert. For greater depth of flavor, I like to infuse mine with espresso powder. This is a rich and decadent dish that I will usually reserve for special occasions, and what better night to splurge on a chocolaty dessert than Valentine’s Day? Bon appétit! Season the steaks generously with salt and pepper on both sides. Heat 2 teaspoons oil in a large oven-safe skillet over medium high heat. Add the steaks to the pan and sear 2-3 minutes until a golden crust forms. Turn the steaks over and and cook another minute, then transfer the skillet to the oven. Cook until steaks are desired doneness, about 6-10 minutes for medium rare depending on the thickness of the steaks. Carefully remove the skillet from the oven and place the steaks on a plate. Cover with foil to keep them warm while you make the sauce. Heat the skillet on the stove over medium heat and add the remaining teaspoon of oil. Add the shallots and garlic and cook 30 seconds until shallots start to soften. Add the pomegranate juice and stock and turn the heat up to high. Simmer until the sauce is reduced by half and slightly thickened, a few minutes. Lower the heat and whisk in the mustard and butter. Season the sauce to taste with salt and pepper. Remove the garlic clove. Serve the steaks with the pomegranate Dijon sauce drizzled on top. Garnish with pomegranate seeds, if desired. Toss the tomatoes and asparagus with the olive oil and season them with salt and pepper. Place the vegetables on a baking sheet sprayed with cooking spray. Roast the vegetables in the oven for 15-20 minutes until the tomatoes are softened and the asparagus is crisp tender. Arrange the vegetables on a platter. Drizzle the vinegar over the vegetables and sprinkle the cheese on top. Heat the cream, milk, sugar and espresso powder in a medium saucepan until it just comes to a boil, stirring to dissolve the sugar and espresso powder. Turn off the heat and add the chocolate. Stir until the chocolate is completely melted. Whisk the egg yolks in a large bowl. Pour a small amount of the warm chocolate mixture into the yolks, whisking constantly. Pour the rest of the mixture into the yolks in a slow stream while whisking. Pour the mixture through a fine-mesh sieve into 4 ramekins. Place the ramekins in a large roasting pan or baking dish. In a kettle or small pot, bring about 4 cups of water to a simmer. Place the roasting pan on a shelf in the middle of the oven and carefully pour the simmering water into the pan so that it comes halfway up the sides of the ramekins (this is referred to as a hot water bath). Cover the pan with foil and bake in the oven until the edges of the custards are set but the centers are still slightly wobbly, about 45-55 minutes. Remove from oven and place the ramekins on a wire rack to cool for an hour. Then refrigerate until cold, a few hours or overnight. Serve pots de crème with a dollop of lightly whipped cream, if desired. Garnish with chocolate shavings and a dusting of espresso powder. Here are a couple of side dishes that would be perfect with this meal! What are you having for dinner this Valentine’s Day? Leave a comment and let me know! Who would want to go out when you can have a meal like this! Wow! Perfection! Thank you! Yes, this year I will definitely be staying in on Valentine's Day- it's more romantic! These dishes are a feast for the eyes and I'm sure that they will taste absolutely delicious. I'm a vegetarian, my husband isn't and we're both chocoholics! Thanks for stopping by! If you're chocolate lovers, you definitely have to try the pots de crème (and be sure to make enough for leftovers!). Happy Valentine's Day! Thanks, Angela- am looking forward to trying your chocolate soufflé recipe! Wow! What a feast! The filet mignonette looks incredible and surprisingly simple! Thanks, Emily! Yes, the steak recipe is easy to make and with a cut like filet mignon, you don't have to do too much to it. Happy Valentine's Day! Lovely menu, Sonali. I love those asparagus. Thank you! Yes, these recipes are all easy to make. The pots de crème can even be made ahead of time and refrigerated for a couple of days. Happy Valentine's Day! Wow what a fantastic homemade Valentine's Day dinner. Every course is impeccably delicious and eye appealing. I normally cook Valentine's Day dinner at home but this year I decided to eat out for a change. Otherwise I'll definitely put the recipes in use. Thanks so much for your comment! I had a lot of fun preparing and photographing this meal. I love your pictures on instagram! Happy Valentine' Day! Thanks, Kiran! Happy Valentine's Day! Ok, you over achievers are just killin me!!! You and Dr Grace at GracefulCuisine are just inspirational. How do you find the time? Your Valentines Dinner sounds delish and remarkably similar to mine. I did a Bernaise Sauce with our filets, which is no where near as healthful as yours. My roasted asparagus did not enjoy the company of your Vitamin C laden tomatoes, which btw, look lovely. And our desert? Let's just say I put the ER room on alert!! This is my first time visiting your beautiful cyber home, but it will not be my last. Thanks for your comment, Jill! It is hard to find time to do it all but I love to cook so I end up spending most of my free time creating and developing recipes. Your Valentine's Day feast sounds delish- I love a good Bernaise sauce! Btw, I started following your Facebook page. These recipes look great!! I'm trying all three for our anniversary. But I need help choosing the right red wine for this particular Filet Mignon recipe. Any suggestions? I've never tried a Dijon sauce with steak yet. My husband and I enjoy the sweeter, rather than dry, wines. Thank you for your comment and Happy Anniversary! If you prefer sweeter red wines, you might want to try a port or sweet Lambrusco, an Italian wine. I think they would both work well in this dish. I like to add mustard to my pan sauces- it helps thicken the sauce and it adds nice flavor. If you're hesitant, start with a little and add more to taste. Good luck! I would die for vegs and dessert, but not the meats. Any suggestions for salmon? Yes, salmon would work great in this menu! I have a few salmon recipes on my site- you can find them by clicking on the "Recipes" link at the top of the page. I shared to my Foods for Foodies group I hope that is okay. I copied your link. Let me know if I did something wrong. thanks so much! No problem- thanks for sharing!